Johannes Kepler: Mathematician, Mystic… Murderer? The progress of science sometimes comes down to an unlikely partnership, a combination of the right people studying the right problem at the right time. In the pantheon of unlikely partners, few can top the team of Johannes Kepler and Tycho Brahe, two men of polar-opposite personalities who finally cracked the secret of the motion of the planets. Here is their story. Working in the late 16th century from his island observatory of Uraniborg, which he ruled like an eccentric king, the Danish astronomer Tycho Brahe compiled the most accurate measurements of the positions of the stars and planets. Tycho was not a humble man, but he knew he hadn’t the expertise to turn his work into an overall theory of the motion of the solar system. Tycho needed the help of a skilled and motivated mathematician, one who had the insight and perseverance to make sense of his data. Surprisingly, in the year 1600, one arrived. His name was Johannes Kepler, who, despite his idiosyncrasies, used Tycho’s work to unlock the secrets of planetary motion and help touch off the scientific revolution. Kepler and Tycho could not have been more different. Tycho was wealthy and flamboyant, connected to royalty and given to throwing lavish and drunken parties. Famously, Tycho wore a silver prosthetic nose, having once lost part of his real nose in a foolish duel as a young man. He was the proud owner of a pet elk, but the poor beast drank too much beer from the cups of guests during a festive dinner and died after tumbling down a set of stairs. While holding court, Tycho often tossed scraps to a dwarf named Jepp who hid under the dinner table. Tycho’s wealthy benefactor, King Frederick of Denmark, drank himself into an early grave, so Tycho simply leveraged his considerable reputation to solicit funding from Rudolf II, the Holy Roman Emperor, to build a new observatory near Prague. Kepler, by contrast, was an awkward, self-tortured neurotic. His mother was nearly burned at the stake as a witch, while his father, a drunk and a wife beater, supported the family for a time as a mercenary before disappearing when young Kepler was five years old. In school, Kepler was ridiculed by his classmates and he failed his attempt to become a Lutheran minister. So he turned to mathematics and made a living teaching and casting horoscopes to noblemen, an occupation for which he was rarely paid and routinely mocked when he bumbled into court with ill-fitting and food-stained clothes. Kepler’s early scientific ideas were naive, if not foolish. Inspired by the ideas of Pythagoras and Aristotle, who believed nature was governed by symmetry and numbers, Kepler once suggested the relative sizes of planetary orbits were set by the dimensions of nested Pythagorean solids, an idea so elegant he believed it simply had to be correct. But it was not. Kepler’s Platonic solid model of the solar system. Yet Kepler was a determined man, fixated on discovering the architecture of the solar system. He knew the value of Tycho’s precise measurements of the apparent motion of the planets, so he wrote fawning letters to the great Danish observer and offered his services as a mathematical assistant so he could access Tycho’s data. It worked. In 1600, Tycho hired Kepler, then 29 years old, to interpret his measurements. But the pair quarreled constantly. Kepler accused Tycho, with reason, of jealously guarding his best data. Tycho relented by giving Kepler his measurements of the motion of Mars. Tycho knew what Kepler did not: Mars was a tough nut to crack and its motion had puzzled astronomers for more than two thousand years. Kepler, awkward but arrogant, declared he would solve the motion of Mars in eight days. It took him five years. Yet Kepler had excellent mathematical ability and an astonishing work ethic. And despite his mystical inclinations, he was skeptical– of his own ideas most of all– which is the mark of a good scientist. Kepler was convinced, like most astronomers, that planets followed perfectly circular orbits around the Sun. He filled hundreds of pages with patient calculations, trying seventy variations of circular orbits of Mars in an attempt to explain Tycho’s observations. All failed. Finally, in 1605, he imagined the motion of Mars as from the Sun, rather than Earth. This led him to a shrewd insight: Mars moved in an elliptical rather than circular orbit with the Sun at one focus. Everything fell into place. He hadn’t the time to make the same calculations for the other planets, so he simply (and correctly) assumed all planets moved in elliptical orbits. It was a profound scientific discovery. Tycho did not survive to celebrate Kepler’s achievement. The great man died in 1601, aged 54, ostensibly from a burst bladder after drinking too much beer at a royal dinner party and stubbornly refusing to excuse himself in the presence of his noble guests. For decades, some believed Tycho died under more suspicious circumstances. A ruptured bladder is a relatively rare affliction, and medical historians suggested Tycho’s symptoms of pain, delirium, and kidney failure may have been caused by mercury poisoning. Some suggested Tycho’s cousin Erik Brahe may have slipped mercury into his drink at the behest of an angry Danish king. Others suggested that Tycho may have accidentally poisoned himself with mercury while self-medicating for a kidney ailment. But it was Kepler who, in a way, had the most to gain from Tycho’s death. He was appointed to succeed Tycho as imperial mathematician and charged with continuing Tycho’s work. He immediately gained a raise in pay and access to all Tycho’s data. And Kepler had access to mercury in Tycho’s observatory labs. But was he crazy enough to kill his wealthy collaborator? To settle the matter, a group of historians in 2010 petitioned to exhume Tycho’s remains from a Prague church and submit them to forensic tests. The conclusion? Tycho’s remains had no excess mercury and there were no signs of foul play. Kepler was no murderer. 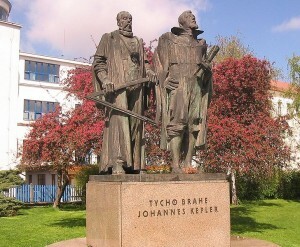 Statue of Johannes Kepler and Tycho Brahe in Prague. After Tycho’s death, Kepler enjoyed more than a decade of productivity. He used Tycho’s measurements to deduce three laws of planetary motion which are still learned by students of physics and astronomy today. These laws led directly to Newton’s discovery of the Law of Gravitation later in the 17th century. Yet Kepler’s scientific success did not assure his personal fortune. Kepler now ranks with Galileo and Newton as a key founder of modern science. His legacy has been marked in many ways… official holidays, stamps, statues, even a hiking trail in New Zealand. One of the Moon’s most prominent craters is named after him. And NASA named its recent successful mission to find planets around nearby stars after this great, if unlucky, mystic-mathematician.